What Should I Look for in a Fence? It goes without saying that certain types of fencing can’t cut it for certain purposes. Timber fences, for example, make a poor choice for industrial security fencing, whilst steel fencing excels due to its toughness and malleability for custom design. The first question you must ask yourself is this: what is my fence for? Next you must consider its purpose. But to top it off, a fence ought to look a certain way. If it’s for your home, then aesthetics, as well as functionality is important. But, even in the case of industrial security fencing, out of public sight, the aesthetic of a fence is still important—to look imposing is a vital part of the battle. The old timber fence has enjoyed popularity for centuries. Whether used for a picket fence, split rail fence, or something in-between, timber is widely available on the market. When considering the pros and cons of timber, however, note the following: timber fences require a high degree of maintenance. If it’s only the aesthetic of wood you’re after, then it’s worthwhile knowing that there are modern materials out there which provide a much wider array of functionality at a cheaper price, without compromising on aesthetics whatsoever. Aluminium slat fencing, for example, is versatile, durable, and highly malleable in the way it can be designed, all whilst requiring far less maintenance than its counterpart timber fencing. Take one look at the market in recent times and it’s clear there’s a new player in town. The properties of aluminium make it a perfect choice for a fence in practically any situation. From an aesthetic perspective, aluminium can be designed to look like wrought iron: imposing, strong, and classy. Yet aluminium fencing can be colourful, modern, and professional, suiting a wide range of décor and environment types. From a functionality perspective, aluminium fencing provides excellent security and fairs well against Mother Nature. 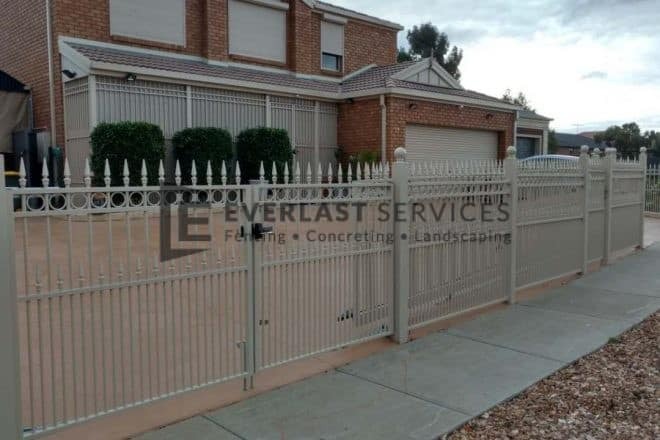 In fact, aluminium is one of the top materials available if you want a fence that can resist corrosion – perfect for the varied and extreme poles of Melbourne weather. An investment in an aluminium slat fence is an investment for a lifetime. Imposing. Secure. Industrial. Not so pleasing on the eye? Not necessarily. Steel fencing, from a functional perspective, has everything you could want from a fence. But for whatever reason, it’s often thought that steel fences can’t stack up from a design perspective. It’s one of those myths that the savvy consumer won’t be fooled by, and can use to their advantage. Steel fencing is in fact highly customisable, and in the hands of a skilled and experienced provider, malleable for design purposes. The benefits of steel fencing can be explored more comprehensively here. But it’s worthwhile to highlight a few key areas in which steel fencing excels against different types of fences. The quality we’ll focus on here is value for money. Steel fencing, whilst it may cost marginally more upfront than a timber competitor, will absolutely soar ahead from a value perspective as time goes on. The durability of steel against almost anything that can be thrown at it by nature or man simply blows timber right out of the competition. An economic decision such as this can add value to your property, as well as reduce insurance premiums. A highly promising alternative you may not have heard of, Colorbond fencing is manufactured in Australia by BlueScope steel. With 14 colours to choose between, design options are varied, whilst the varied panel styles each accentuate sleek lines that look fantastic on both sides. More and more, Colorbond fencing is chosen for the aesthetic it offers in both professional and home-based settings, along with the famous durability of steel. Termites? Not a chance. Maintenance? Easy. Fire hazard? Entirely the opposite – Colorbond fencing is designed to resist the onset of fire.